Dorianne and I have been on the road since March, in Europe and the U.S., and I have been blogging along the way. I thought it might be helpful to do a post about Wine Tips for Travelers. 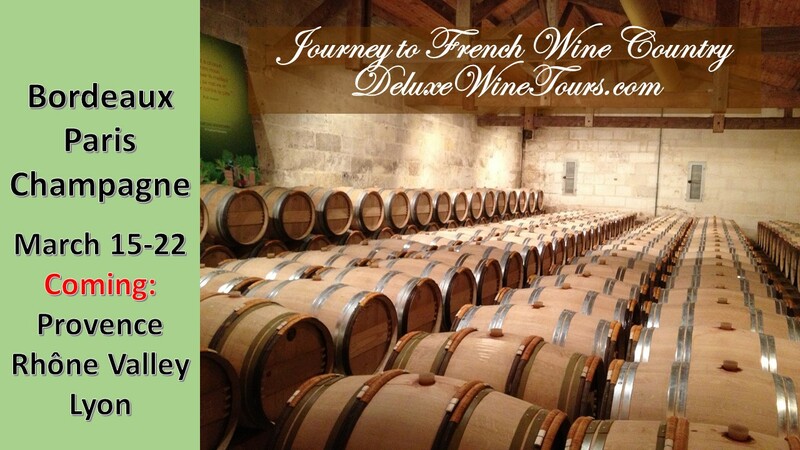 And, of course, if you love wine travel – join me for our Tour of Bordeaux, Paris, and Champagne in March (LINK). 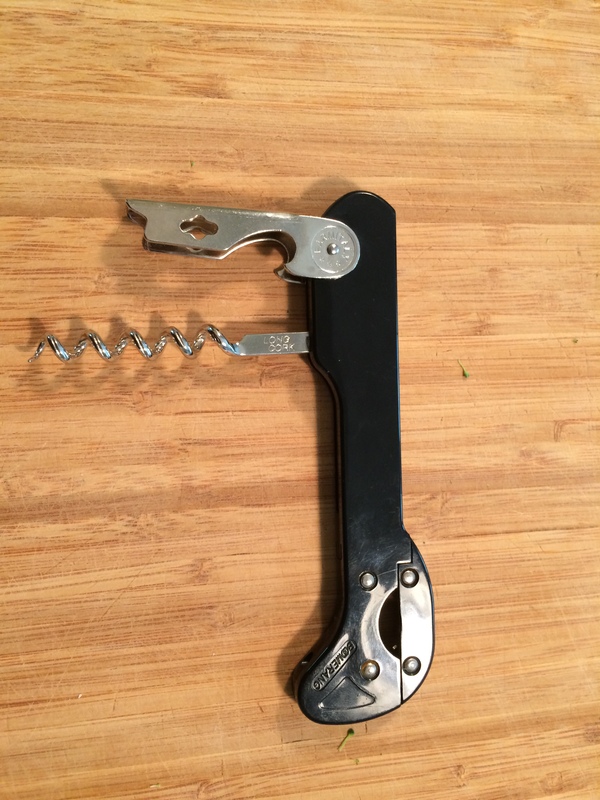 The best travel corkscrew that I have found is this little gem, The Boomerang, I purchased for $6.99. 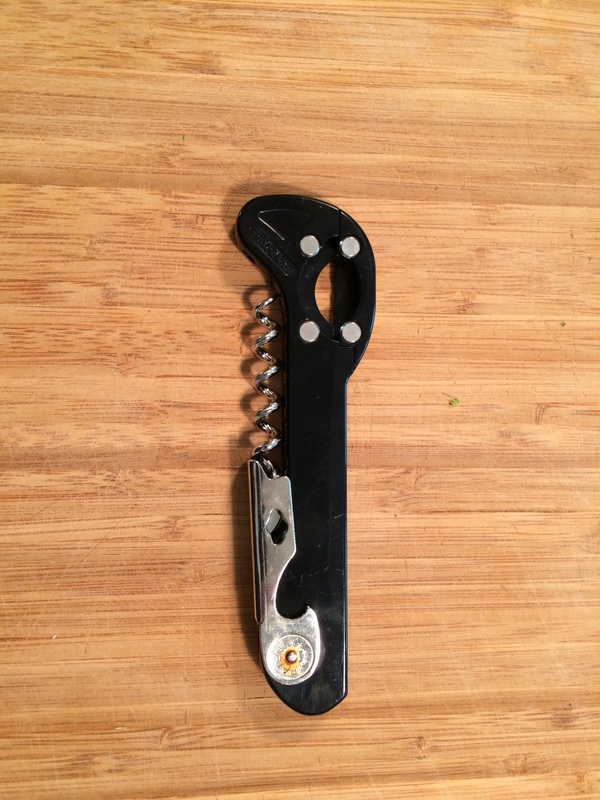 After having a number of corkscrews confiscated by TSA agents at U.S. airports, I began to look for one that did not have a knife blade as a foil cutter. This one has four discs that cut very evenly around the top of the foil. The corkscrew itself seems a bit fragile, but I have opened over 100 bottles with it with no sign of it slowing down. I do, however, carry a backup. The history since 9-11 is that all corkscrews were originally banned from carry-on luggage because of the knife blade as a foil cutter AND the corkscrew itself. This was relaxed a few years ago, but the ban on the knife blade has continued. flight attendants. My wife and I were in coach. The flight attendant brought us a package wrapped in plastic bags and said, “Mr. Lockard, you left this in the front of the plane.” Opening it, I found a bottle of very nice Chardonnay and two glasses from the first class cabin. My corkscrew was in the pocket of my backpack under the seat in front of me! I have also blogged about the Best Corkscrew (LINK), the Cork Pops Legacy Wine Opener, but that model, being powered by gas capsules, is not suitable for travel. If you can only afford one of these, get the traveler – it’s much cheaper, and you can use it at home or on the road. There are a couple of things that you might want to know about taking wine with you on airlines and cruise ships. First, is how to pack the wine so that it is safe and does not spill onto the contents of your suitcase. Many times, I have traveled with wine bottles in my checked luggage. 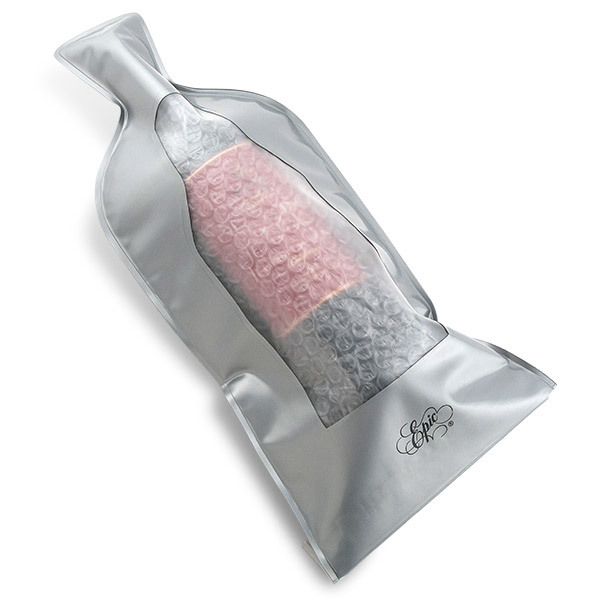 What I usually do, if it is just a bottle or two, is either use a special wine bottle protector, or, absent that, wrap the wine in some clothing like a sweatshirt or a bathrobe (what, you don’t travel with a bathrobe?). It is best, of course, to have the protector. If you are flying with more wine, like a case or so, it is best to get wine luggage and check it through. There are a number of products on the market. 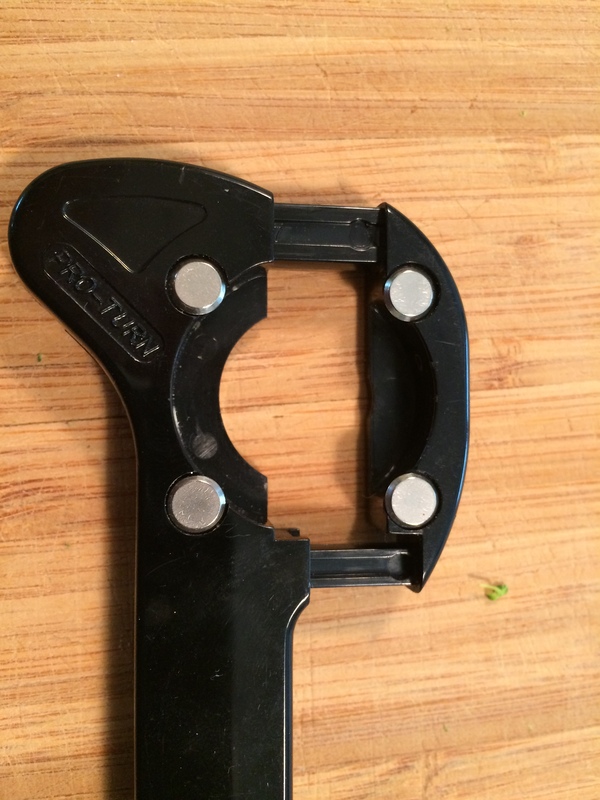 I like Lazenne (LINK), a light but stable product that works great for most uses. They also make wine bottle protectors. I did a blog post on bringing wine into the U.S. and customs duties, etc. Here is the (LINK TO THAT POST). Actually, duties on wine are lower than you might expect, and paying the extra airline fee, if there is one, to ship a case of wine is a relative bargain. Cruise ships can be another story. Oceangoing cruise lines often have a policy restricting bringing alcohol on board. If you make purchases on shore excursions, the booze is often taken upon re-boarding and held until you disembark. You can usually get away with having some wine in your luggage initially, but that will, of course, be somewhat limited. If you are concerned about this, check with the cruise line to see what their policy is. River cruises are often different. We recently went on a Viking Cruise Lines (LINK) ship on the Rhine River. We were encouraged to bring wine purchases aboard to have with dinner – no corkage fees. The reason for this is that this cruise offers complimentary wine with meals, so any wine that you bring on board saves them money. I still liked the policy, and we did bring some wine on board to consume. I am not a big fan of any of the wine apps I have used so far. I guess the best is Delectable (LINK), which lets you scan the label and view a bit of info and any other reviews that happen to have been posted. It also lets you review the wine. The problem is that, while it recognizes most wines that you find only in Europe, there is a paucity of information and very few, if any reviews on them. For locating wine venues, from wine bars to châteaus to good wine restaurants, I use TripAdvisor.com and occasionally, Yelp.com and Google.com/maps. These work as well in Europe as in the U.S., meaning that they are okay, not really great. Better to find a local wine bar or wine shop, make friends with the bartender or proprietor and ask questions about the local wine scene. If you know of something better, please leave a comment to this post. While wine has become more and more prevalent in many parts of the world, there are some places where wine either isn’t available, isn’t good when it is available, or is so pricey that there are better options. We were in Iceland (LINK TO THAT POST) in May for a few days. There is wine there, but it is extremely expensive due to shipping costs and UK duties on New World Wines. As my post at the time indicates, we found some great local beers and did just fine. Prague is near some decent wine regions, particularly in Hungary, but I found that my lack of knowledge of the local wines was a problem. So we went with the huge array of excellent beers there as well. Next month, we head to Oaxaca, Mexico for a month of Spanish Immersion Classes and the amazing cuisine of that region (think chocolate, mole sauces, and coffee). Not a wine region in sight, and if there is wine, it will be served at room temperature – about 80 degrees Fahrenheit. No, we will stick with beer and the fantastic Mescals of the area. Take a good travel corkscrew and a backup. 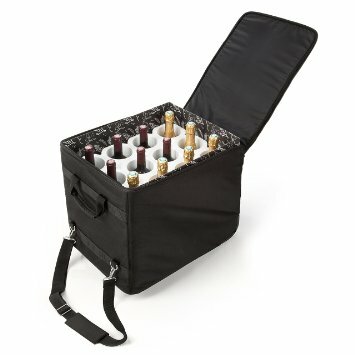 Select one or two good options for carrying wine with you. Learn your online and local wine resources. Remember – when there isn’t wine, there is always something else. So never let your travels be dictated by your own failure to prepare. Sampling the local wines when you travel is a great experience (even if the wines aren’t always so good), and the people in the wine industry, from the vineyards to the retail shops, have been great people wherever we have traveled. We aren’t done. After Cleveland, we head to Southern California, then Mexico, then Hawaii, then Southern and Northern California through January – then, who knows? But you can be sure that I will be blogging all the way.